Frugal Easter activities for your children and your family to try. Every year moms scramble to find just the right easter basket. Will it be the sports easter basket for $20 or the Spiderman one for who know how much? When did easter gifts become so expensive? The average family has 2.4 children and Easter gifts can break a budget in a hurry. 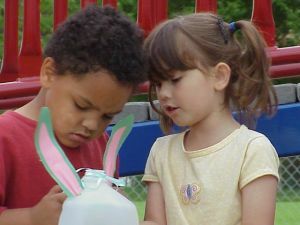 Here are some wonderful Easter memory creating ideas that won’t break the bank. For most kids, easter is not easter without decorating eggs. This year instead of letting the kids have all the fun, start a tradition that involves the whole family. Throw an annual Easter egg decorating contest. Choose enough categories so everyone gets a chance to win. Some categories might be: funniest egg, most original egg, scariest egg, or celebrity egg. The wackier the categories, the more fun you will have decorating and judging. Ask everyone to submit an egg and display them on the kitchen table. Ask Grandma and Grandpa to be the judges. Before you know it, you will have trouble finding judges because everyone will want to decorate an egg! This is a simple tradition that doesn’t take much preparation. All you will need to do is buy some narrow inexpensive ribbon from a local craft store. Choose a different color for each member of the family (15 to 25 yards per person depending on how crazy you want this to be). Once the kids are in bed, tie a ribbon to each of their hidden baskets and wind them in and out of the furniture and the other ribbons until you can’t see where they began. Bring the ends to one central location (perhaps the kitchen table) as a place where your family can begin the entangled maze to find their baskets. Before you know it, everyone will be tangled in ribbons and laughs. On Easter Sunday, gather the adults together and have them each hide one or more eggs somewhere on themselves. It might be in Grandma’s apron pocket, Uncle Bob’s boots, behind Dad’s glasses, or under Grandpa’s hat. This hunt isn’t just for the little ones, it involves everyone and is a wonderful way to connect the generations. Your family will be sure to get a laugh as the kids poke around looking for hidden eggs. No one and no place is considered out of bounds. You’ll definitely want your video camera ready for this Easter Egg Hunt. 5. Personalized Letter from the Easter Bunny! What child does not get excited about getting mail? How about a personalized letter to your child from the Easter Bunny. This letter will be mailed directly to you child and talk about how mom and dad have told the easter bunny that he/she has been good. What an exciting memory for your child! Easter baskets and gifts do not have to ruin your budget in order for them to be meaningful. These are just a few ways in which you can start some family easter traditions with your family. Here’s to a wonderful traditions filled Easter!